Preparation: Be sure the grill is completely cool before cleaning. 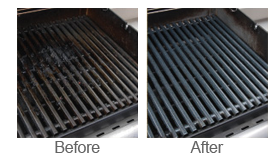 It's a good idea to wear protective gloves if you're soaking your grates in SuperClean. We recommend you wear protective eyewear in windy conditions.